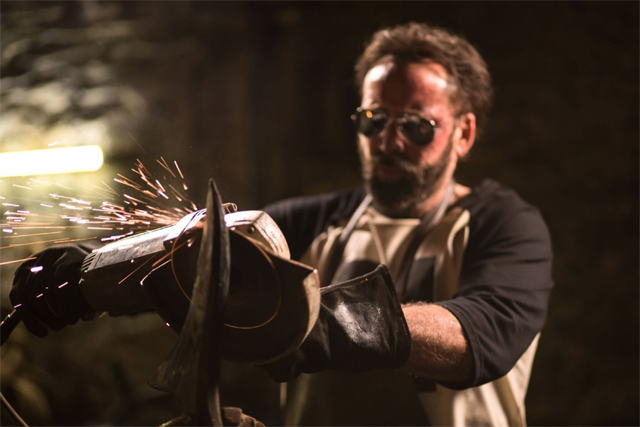 RLJE Films will release critically acclaimed new Nicolas Cage action-thriller Mandy this weekend, and ComingSoon.net got a chance to chat with its co-writer and director Panos Cosmatos. 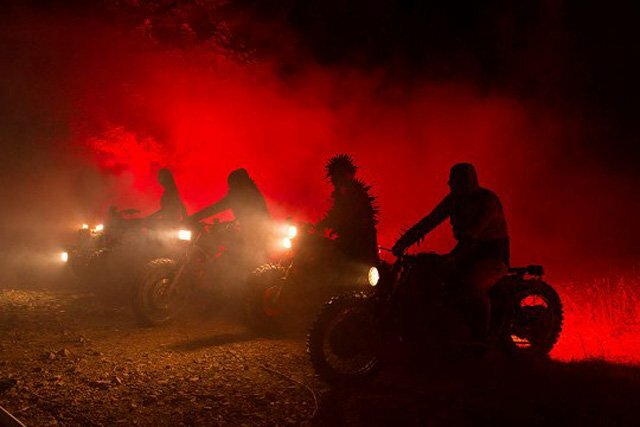 Mandy marks Cosmatos’ sophomore feature after the 2010 abstract horror film Beyond the Black Rainbow, and we chatted about why it took so long to make his second film, how it’s similar to barbarian movies, and which of his father George P. Cosmatos’ movies might have secretly inspired it. Check out the interview below! ComingSoon.net: I loved the hell out of “Beyond the Black Rainbow.” It just hit the perfect groove for me. What was the eight year delay between films? 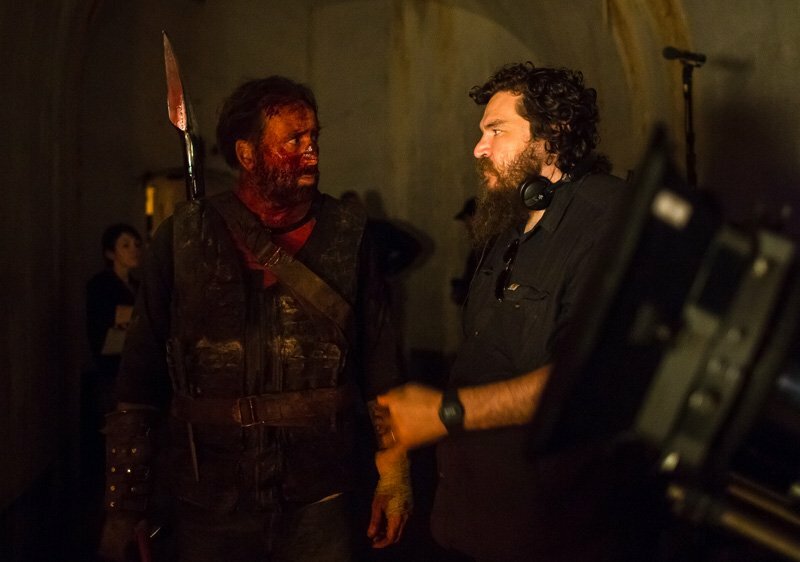 Panos Cosmatos: Yeah, I got involved with SpectreVision very early on and we were going to wait for the right situation to present itself, where we could make a movie the way we wanted. But in order to do that, we also needed a star, and it took eight years for all those plans to align together. CS: Did this script and your vision of the film evolve over that time? Cosmatos: There was a point where we had offered the villain, Jeremiah Sand, to Nicolas Cage and I rewrote the part with him in mind. I ended up doing a pass with the idea of him playing Jeremiah Sand and I think that gave it more of a sort of disintegrating rock star kind of feeling of that era, you know? Cosmatos: Yeah, they’re both kind of one-offs of that same kind of concept and thought that I became fixated on. I started writing both of them at that same time, so I thought that was a very kind of a beautiful and interesting path to take creatively so that both felt like they were expressing their concepts and needs to that framework. CS: And “Beyond the Black Rainbow” had a distinct Cronenberg-ian, “THX 1138” vibe to it. I had a much more difficult time sort of pinning down what your specific inspirations might have been for this one. Can you talk a little bit about that? CS: Yeah, I guess because there is that sort of fantasy element to it. There are some kind of creatures that seem to be beyond reality. Cosmatos: Yeah, and definitely at a certain point I realized that the fantasy barbarian film and those elements kind of run pretty heavily to the surface, but more than looking at films, I was reading D&D modules and stuff like that, just listening to music. I mean, one of the main things that drives my process is listening to music. CS: And speaking of which, this was Johann Johannsson’s last film as composer. What was your creative relationship like? Cosmatos: I loved working with him. Some people you meet them and you immediately feel a close emotional bond with them for no apparent reason and he’s one of those people. He had kind of a gruff exterior, and yeah, I really liked the guy. We responded well to each other’s ideas. 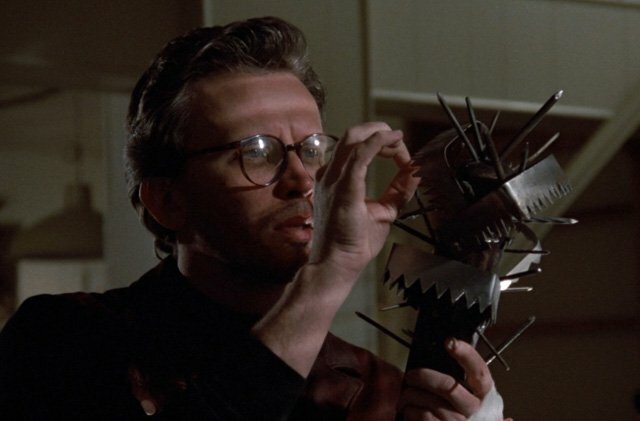 CS: I don’t know if this is too far afield, and maybe I’m saying this just because I recently watched it from Scream Factory, but I thought there was a little bit of “Of Unknown Origin” in this, in the sense it’s a guy on sort of a vengeance quest with kind of ad hoc armor that he’s made. Cosmatos: Yeah, yeah, undoubtedly. I mean, that’s my favorite of my dad’s films for sure. (laughs) Yeah, I mean, I honestly never thought too specifically about it, but now that you mention it there’s probably no question that that’s an influence on it. CS: Has anybody else brought that movie up? Cosmatos: Not that I can think of, no. Cosmatos: (Laughs) No, it’s a good call. CS: In terms of your last movie, you had some really talented actors, but this time you were actually working with marquee names like Andrea and Nic and Linus. What was that experience like? And how was it different from your past experience? Cosmatos: It wasn’t really different at all. I love to choose the right actors. It’s kind of a pleasure to work with them and watch them imbue your concepts that you write. You write a character, but in essence, it’s just a concept of what it could be, and then actors come in and they have their own sort of interpretations and thoughts. If you respond to those and then go forward with them, then it’s kind of like magic to see the idea you had become alive and in the flesh. And in both cases, on both “Black Rainbow” and this one, it’s kind of a magical experience to watch your imagination come to life in the form of their imaginations. CS: In what terms did you describe your very surreal vision for how you wanted this film to feel for an audience? Cosmatos: On this one, I kind of thought of it as a horrible rock opera in a sense, you know? And that was kind of a defining thing in the back of my mind, anyway, when we were working on it. CS: That’s a pretty good summation of it. But I think what surprised me about it is even though it was so surreal and so kind of very off kilter and not of this reality, there was this emotional through line and it was touching in a lot of places. Can you talk a little bit about the emotional element? Cosmatos: Well, yeah. I mean, it was very important to me that you actually care about Red and care about Mandy and feel something for them unless it just becomes a lot of noise signifying nothing, you know? And I really feel it’s important, even for being just an abstract film, you still sort of feel some kind of connection to what you’re watching emotionally, you know? 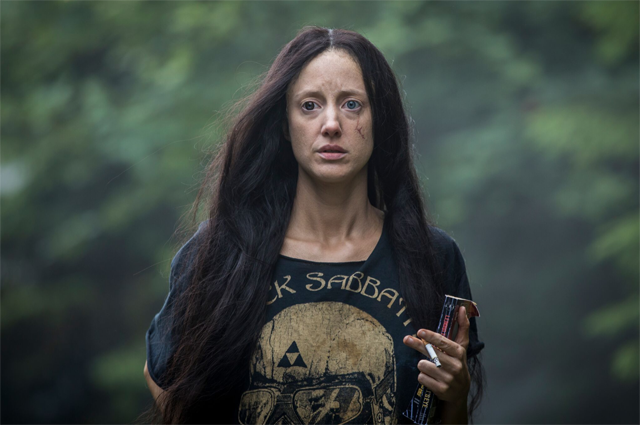 “Black Rainbow” is where you’re watching the TV channels in their inner prison room and it’s a very small, subtle moment, but I feel like it’s there specifically for people to connect with her on an emotional level. I like the idea of cutting these sort of phantasmagorical worlds and it being almost fragile, emotional creatures, you know? CS: Yeah, and what fascinated me the most about it is you encapsulated the relationship between the two of them with almost no dialogue. Is there a part of you that feels less is more when you’re trying to impart feelings and character? Cosmatos: I’m always trying to strip it down to its bare essence and then make that work. I decided to just work on some simple things to kind of—I mean, it’s kind of simplistic, but it’s just trying to evoke something quickly without over-lingering any of it. And I think that’s what her monologue at the start is about. CS: So in the interim between these two films, were you developing any other projects that you’re hoping to get through right now? Cosmatos: Yeah, I mean, I did write another script with my friend, Max Goldblatt, and I’m starting to get into that- now. It’s an original thing right now, but we’ll see. CS: And is there any part of you that feels like you would at all fit into a more mainstream kind of, maybe not even studio film, but a mid-budget level kind of director for hire kind of thing? Cosmatos: I wouldn’t want to do that. (Laughs) If I’m going to sell out, I’m going to sell out all the way, so a bid by the studio would be if you’re going to go through the pain of trying to make a film, it’s gotta be worth it.